(6 points) You know who Von Hayes reminds me a lot of? Andre Iguodala. He does a lot of things well but nothing great, the team overvalued his talents, and he’s never compared against other players but against his own expectations. That said, one day I think we’ll look back and say that Iguodala is better than we give him credit for. Now is the time to look back and say that Von Hayes was better than we give him credit for. From 1984 to 1990, only 17 players played in 100 games each season with an OPS+ (On-base plus slugging) of at least 100 each year. Pretty decent company, eh? Furthermore, the trade really wasn’t that bad. 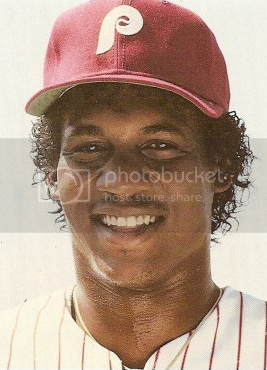 The only person of consequence the Phillies gave up was Julio Franco. Yeah, he turned out to be about as good as Von Hayes, though for a hell of a lot longer. But over the 6 years after the trade was made (as long as Franco was in Cleveland), Hayes was the slightly better player. So this was hardly Moses Malone for Jeff Ruland. But the 5-for-1 tag haunted Hayes’s entire career. It was an unfair way to assess what was an absolutely stellar career in Philadelphia. Hayes is 20th in team history in career doubles, 24th in career hits, 10th in career steals, and 17th in career home runs (despite playing during a dead ball era). But pretty much every old article you find online starts with the words 5-for-1. Von got ripped in It’s Always Sunny in Philadelphia. He somehow made it into Jayson Stark’s excellent Overrated/Underrated book as overrated. That’s like saying that Rodney Dangerfield gets too much respect. Von Hayes deserves to be seen as a very good player on some very bad Phillies teams, not as the “one” part of a 5-for-1 deal that never lived up to expectations. Hayes currently coaches the Camden Riversharks. On this day in 1989, Pirates play-by-play man Jim Rooker wrote a check in the bottom of the first inning of a Pirates/Phillies game at Veterans Stadium that he never thought he’d have to cash. Obviously, the old sports adage that “anything can happen” wasn’t on his mind. Before Rooker made his now famous quip, the Pirates had 16 batters come to the plate in the top of the first inning which looked more like batting practice than anything else. Phils starter Larry McWilliams was chased after giving up 4 hits and 6 earned runs while registering just one out. By the time the top of the first came to a close, the Pirates boasted a 10-0 lead. It didn’t take long for the Phillies to get on the board. After a Randy Ready leadoff double in the bottom of the first, Von Hayes blasted a home run. Then, in the bottom of the third, Hayes cut the lead to 10-4 with another 2 run home run. In the next inning, a Steve Jeltz (yes, Steve Jeltz,) 2 run bomb made it 10-6. The Pirates added a run in the 5th, but Jeltz homered again in a 4-run 6th (Jeltz hit two of his five career Home Runs in this game!). In the bottom of the 8th, with the Pirates leading 11-10, John Kruk scored the tying run on a wild pitch. Darren Daulton followed that up with a go-ahead 2 run single and Curt Ford added two more runs with an RBI triple. The Pirates went scoreless in the top of the 9th and the Phillies won by a final score of 15-11. Purchase a 1980s Phillies cap here. 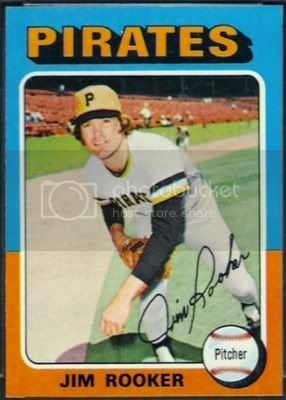 The next day, Three Rivers Stadium was flooded with calls asking whether Rooker followed through on his promise. After realizing people weren’t going to let him live it down, Rooker agreed to do it. After the ’89 season, Rooker strolled the 308 miles from Philadelphia to Pittsburgh over the course of 13 days, raising $81,000 for charity in the process. Just 10 days after the June 8th Phillies game, the Pirates were up 10-0 in St. Louis. Larry Fratare, the Pirates other announcer, laughingly asked Rooker “And if we lose this game?” Rooker’s reply: “Yes, if we lose this game…our road record will be 11-23.” At least he learned his lesson. Sidenote: Steve Jeltz’s first home run in the 4th inning was hit lefthanded off Pirates right-hander Bob Walk. His second came righthanded off the lefty reliever Bob Kipper. Jeltz became the first player in the Phillies 107-year history to hit a home run from both sides of the plate in the same game. Tomas Perez (2001) and Jimmy Rollins (2006) are the only other Phillies to do the same. Of note, the first player in major league history to accomplish this feat was Wally Schang of the Philadelphia Athletics, who did so in 1916.